Home » Coast to coast » What is the Left going to do about the government’s plan to crush the Black Lives Matter uprising? The government is planning to crush the Black Lives Matter uprising that swept the country in the aftermath of the rebellion against racist police violence in Ferguson, Mo., last year. The repression that is being prepared against this uprising will be far greater than the repression of the Occupy Wall Street movement because the Black Lives Matter uprising poses a vastly greater threat to the system. Politicians and police officials had hoped that the national uprising would run out of steam. 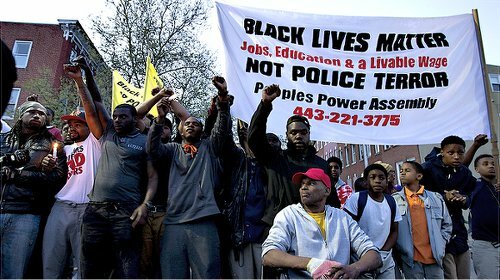 However, the revolt in Baltimore over the murder of Freddie Grey in April — a revolt that quickly spread across the country — is undeniable evidence that the uprising that has shaken the capitalist establishment is not going away. Local police departments coordinated by the Department of Homeland Security, with the participation of the FBI and the Pentagon, are planning to crack down hard on massive protests against the police. In fact, the new level of coordinated repression has already begun. The deployment of the National Guard in Baltimore and the setting of a curfew constituted a calculated experiment to test how these measures could be used to make mass arrests and break up protests with overwhelming police force. Over the past few weeks, police have attacked protests against police violence in New York City, Philadelphia, Cleveland and other cities, beating and arresting hundreds of protesters. In Oakland, Calif., a ban on protests after dark has been imposed, and other cities are planning to impose similar bans. So-called “anti-terrorist” strike forces are being organized by the police for the explicit purpose of crushing protests. Some cities, including New York City, are planning to elevate the charge of resisting arrest from a misdemeanor to a felony. This is just the beginning. The police are preparing for greater repression as they get ready for the anniversary of the murder of Michael Brown in August. Politicians, along with pro-system civil rights personalities and the media, are providing political cover to the police by echoing the pretext of “stopping violence” for crushing protest. 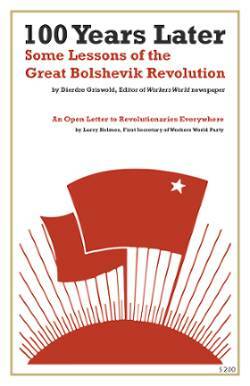 What is it about the National Question that distinguishes it from all other questions in the minds of communists? Is it morally superior to other issues? No, it is not. The National Question is wholly unique in significance because understanding it, and acting on that understanding is essential to classwide solidarity. To negate the National Question is to surrender to the ruling class its most potent weapon against the working class. The Black Lives Matter uprising is fundamentally a reincarnation of the Black liberation struggle. The capitalist class understands that its continued existence is dependent upon keeping such a liberation struggle as separate and isolated from the working-class movement and progressive movement as possible. Conversely, the more that the entire movement takes up the liberation struggle, the more difficult it becomes for the capitalist state to carry out massive repression. Keeping the oppressed isolated is key for the ruling class. The best circumstances for the system to succeed with its plan to crush this uprising of the oppressed is to keep such a struggle geographically, or at least politically, to a greater rather than a lesser extent, isolated from the working-class and progressive movement. The participation of young white activists in support of the Black Lives Matter uprising has been impressive, even unprecedented. Still, taken as a whole, the Left, specifically the white Left, has largely been missing in action thus far. This is dangerous and it must be rectified. No doubt, if the capitalist state can get away with isolating and then smashing the Black Lives Matter uprising, then it will feel in an even stronger position to use the same repression against the whole working class. There’s a great deal at stake here, because the crisis of capitalism makes bigger confrontations between capitalism and the working class inevitable if not imminent. In the 1870s and 1880s, when the working-class movement was fighting for the eight-hour day in the North, Reconstruction in the South — a short period of time right after the Civil War when Black people attained some small measures of power — was being violently crushed by the lynchings and terror of the Ku Klux Klan, with the support of government. The working-class movement in the North did little if anything at all to stop the racist counterrevolution against Reconstruction. Unfortunately, the failure of the broader working-class movement to respond to the national oppression of Black people at the end of the 19th century established a pattern of similar disappointments since that time. A lot has changed since Reconstruction was crushed; however, none of that change has negated the National Question, as it pertains to Black people. Fast forward to the fall of 2014. Imagine how earthshaking it would have been if the climate change march of several hundred thousand people in September in New York City — which, while certainly not all white, was mostly white — had instead been a solidarity march with the uprising in Ferguson. This is not to say that fighting to save the planet from capitalist pollution isn’t an urgent issue, but rather to point out that at that moment, the more urgent crisis for the mass movement was the Ferguson uprising. For activists and revolutionaries, whether your primary concern is opposing U.S. imperialism, fighting capitalism, supporting the working-class struggle or fighting for socialism, a deeper look at the significance of the Black Lives Matter uprising should be enough to convince you why it’s crucial, perhaps even decisive that you need to support it. This uprising has once again demonstrated that the Black Liberation struggle is central to the struggle against U.S. imperialism. This does not take anything away from the many fronts in the struggle against U.S. imperialism across the world; it’s simply an acknowledgment of reality. The police war against Black and Brown youth, including the mass incarceration of young people of color, is not going away no matter how much talk of reforming the police there is, and no matter how many police departments the Justice Department investigates. In fact, the war is going to intensify. Why? Because the war is a direct consequence of the new globalized, high-tech capitalist order. The police and the prisons are being used to regulate and downsize the labor force. Capitalism no longer has even low-wage jobs for Black and Brown youth, so the system is carrying out social genocide employing gentrification, austerity and police state measures as its primary weapons. For all who are interested in the working class, for your information, the people being targeted by the police represent the fastest growing segment of the working class. One of the many things that the present and any future stage of capitalism is certain to do, is to swell the ranks of the unemployed and underemployed, first amongst young people of color, women, immigrants, those with disabilities and then against the entirety of the working class. The time has come and gone for antiquated ideas about who is and who is not in the working class to be swept away. The fact is that the composition of the working class, like everything else, is constantly changing, just as the capitalist economy is constantly changing; this is called dialectical materialism. Unless the definition of the working class is constantly revolutionized and made more inclusive of the most oppressed, and moreover, unless the organizations of the working-class movement reflect this constant change — change that must not only affect the organization of the working class but also its ideological direction — the working class will not find the road to the socialist revolution. The Black Lives Matter uprising is both a rebellion against national oppression and a working-class rebellion. Like all movements, the Black Lives Matter movement is not politically homogeneous. It is nonetheless very radical, very militant, very anti-capitalist and has the potential to become, at least in part, a revolutionary movement that could play a pivotal role in revolutionizing other sections of the working class. It is no small thing that compared to other phases of the Black Liberation struggle, there are more women and lesbian, gay, bisexual and transgender people playing key roles in the Black Lives Matter uprising. This tends to make the uprising more radical and multinational. What’s also true is that within this young movement, there is a perception that, generally speaking, the Left, particularly the white Left, is either too weak, too divided and sectarian, or just too conservative to render anything of significance to their uprising. This is one of the reasons why this uprising, by and large, is not looking to the Left for either support or answers. Whether that assessment is fair or not, all should take note. The question is before all of those who consider themselves part of the Left, but are not relating in any meaningful way to this uprising, are you prepared to plead guilty to irrelevance? The one-year anniversary of the Ferguson Rebellion is a few months away. Before that anniversary, there is the anniversary of the police murder of Eric Garner in Staten Island, N.Y. There is also a major march against police violence planned for Newark, N.J., on July 25. These and other events should give the movement plenty of opportunity to demonstrate its relevance. The question is, will these opportunities be acted upon? The writer is the first secretary of Workers World Party.